REGULAR BLOGGERS USE TAG-CLOUDS, and the sincere ones use them wisely. Whilst on one hand the tags help organise and categorise the posts and thoughts therein, they also help the author not to stray too much away (a cluttered tag-cloud is most likely an apparent symptom of this) from the topics and interests the blog is intended for and targeted towards in the first place. On the other hand, the blog posts are made up in real language using real words that make up the composition by the author. And since the author has his/her own style with grammar and sentence construction, it forms a pattern or trend of words used to produce those thoughts marked under the given tags. 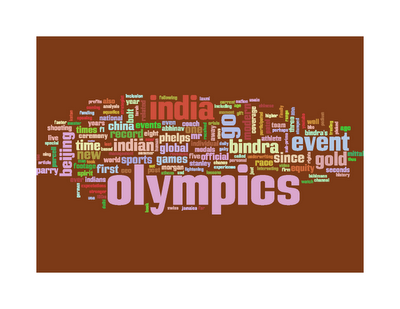 Wordle.net offers this beautiful applet utility that instantly creates a "word-cloud" by consuming your blog feed. Taking it one step further, one can then match this world cloud with the tag cloud of the blog, and make interesting inferences. I also found this word-cloud very useful for literary purposes as well: one could feed in the speeches of Sen. Barack Obama and Sen. John McCain on the topic of Economic policies, for example, and figure out how much do they agree or, apparently, disagree "figuratively". And also, where they agree (or match up word-by-word) could give the indication where the American Economy needs desperate help - or atleast they way any new leadership is most likely looking at it. Paul Kedrosky already did such an experiment by comparing US Federal Reserves Chairman Ben Bernanke's speech this year with that of one year ago. The results are really intuitive. Here, take a look.